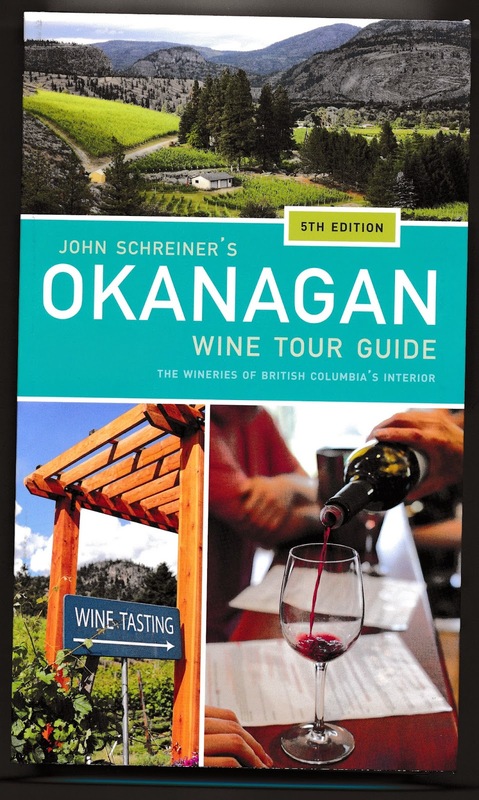 The new edition – the fifth – of John Schreiner’s Okanagan Wine Tour Guide has just been released and is appearing in bookstores, in Okanagan wineries and in VQA stores this weekend. The retail price is still $20. As well, an E-book version is available on Apple’s ibookstore while a Kobo version is in preparation. The paperback book is still in the pocket-sized format of earlier editions, except that you need a bigger pocket. This 5th edition runs to 430 pages and profiles 196 wineries – 42 of which are new just in the two years since the previous guide was published. I wrote the first guide in 2006 because I thought that wine tourists needed a succinct reference book. Each winery profile runs to about 400 words – just long enough to provide the essential background on the people behind each winery. These are the fascinating personal details that you will not get from the tasting room staff: details such as what the winery owners did before they opened a winery; and what drew them to wine. These often colourful details enrich visits to wineries. The wine industry has almost doubled since 2006. The first edition was 248 pages long and profiled 100 wineries, including a handful that were not open and, for one reason or another, never did open. For example, Stone Mountain Vineyard in Okanagan Falls developed a vineyard and produced several vintages but never actually sold any wine under its own label. The promoter was an Arizona housing developer whose finances collapsed in the 2008 recession. The bankrupt project was purchased that year and has since opened as Meyer Family Vineyards. There have been other winery bankruptcies and closures since then but these are the exception to the optimism that buoys the B.C. wine industry. In 2010, for example, seven wineries in the Holman Lang group all went bankrupt. Quite remarkably, five of those wineries have opened under new names and new ownership. As up-to-date as my fifth Tour Guide is, at least five more producers have opened, or are about to, since the manuscript went to bed this spring. Two that I will blog about later this summer are Stable Door Cellars and Coolshanagh Winery. Both are on the Naramata Bench, that compact strip of real estate on which about 40 wineries are now packed. Of the new wineries in the fifth edition, let me highlight the tasting rooms that wine tourists should not miss. Corcelettes Estate Winery at Cawston. The Swiss family who own this are especially proud of their white blend that incorporates Chasselas, the signature Swiss white. Lariana Cellars in Osoyoos. Visits are by appointment. Make the effort and taste perhaps the best Viognier in the Okanagan. C.C. Jentsch Cellars, located in a renovated packing house beside Highway 97, midway between Osoyoos and Oliver. The winery has a very good Syrah and a $20 Meritage blend called The Chase that overdelivers for the price. Culmina Family Estate Winery. Tastings are by appointment, but only so that visitors are well hosted. This is the Triggs’s family winery with, among other wines, the Okanagan’s first Grüner Veltliner. The wine is released under a proprietary name, Unicus. Tightrope Winery, just off Naramata Road, with a tasting room due to open this fall. The focussed portfolio includes a fine Viognier and a very good Pinot Noir. Upper Bench Estate Winery near Penticton. This fine winery emerged from one of the Holman-Lang bankruptcies. The new owners make excellent wine, including the Okanagan’s best Zweigelt, and excellent cheese. Moraine Vineyards on Naramata Road emerged from another bankrupt Holman-Lang winery. It is now owned by wine-loving immigrants from Russia and their winemaker is one of the best consultants in the Okanagan. Deep Roots Vineyard near Naramata. It is owned by the Hardman family who have four generations of agriculture on the Naramata Bench. It shows in the tasting room’s salt of the earth character. Sage Hills Estate Vineyard at Summerland. The organic wines here are excellent and the view from the vineyard is exceptional. BX Press Cidery and Farm in Vernon and Left Field Cider in Ashcroft are two of the newest cider producers in the interior. Sandhill Wines. This is not a new winery; in fact, it has never had its own winery but exists within the sprawling Calona winery. But for the first time, Sandhill has its own tasting room nearby. You can see from that list why you need to get my book before you go wine touring. Upper Bench releases blockbuster reds.